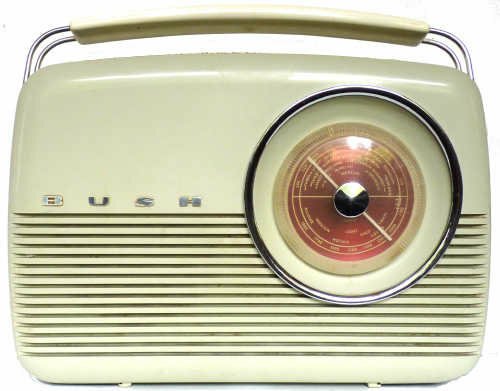 I was lucky to get this radio as part of a job lot on Ebay as nobody else seemed to want them. There was not much wrong with it that could not be rectified with a good clean, though it had been dropped at some time and there were a couple of chips to the case and the cover to one side of the handle was missing. I had to replace the rubber grommets which hold the tuning capacitor in place and use epoxy adhesive to repair one of the internal fixings. It has a cream coloured cabinet and blue leather look sides and chrome trim. 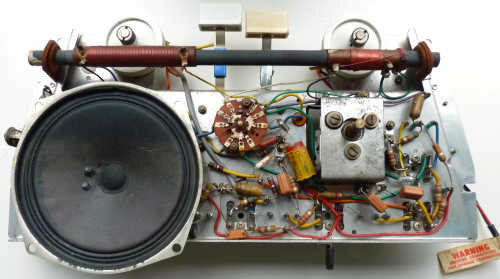 This one of the later versions of the TR82, which has the less reliable AF series transistors. 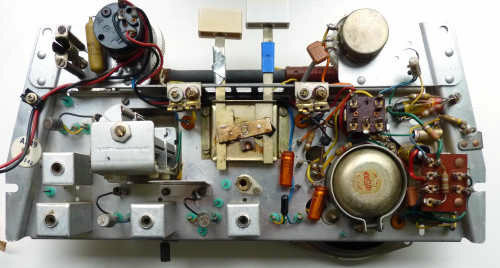 Unlike the original TR82 this has an earphone socket and the BUSH on the front is part of the plastic moulding rather than the separate brass letters of the originals. The white circular disc on the aluminium chassis has the chassis number A349. The pushbuttons actuate a conventional rotary wafer switch.